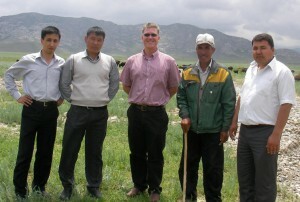 The aim of the visit was to study the potential and prospects in widening of KIVA program in Kyrgyzstan. “I want to emphasize the importance of Bai-Tushum and Partners’ activity in the field of implementation of socially-oriented financing and note a tremendous impact Bai Tushum is having on alleviating poverty in Kyrgyzstan – something I witnessed first-hand in Batken, Osh, and Bishkek. I would like to express my gratitude to the Company’s staff for participation in meetings and discussion on future prospects of KIVA project, which will serve as a starting point for further initiatives and the potentials going forward. Kiva is extremely honored to have this partnership with Bai Tushum and Partners” – said M. Looft. In early May, after having reviewed Bai Tushum and Partners’work carried out in implementing socially-oriented mission by adapting business practices and products to meet customer needs, develop their business and improve living standards, KIVA Microfunds has awarded the Company with “Client Voice” Social Performance Strength badge, which has become the fifth nomination in this field.